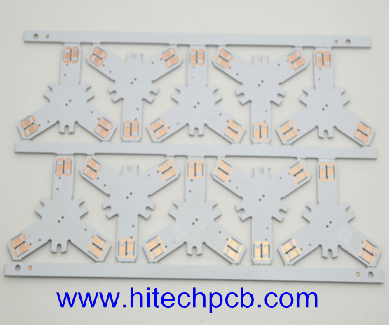 Metal core pcb maker Lite-On Technology, Aluminium pcb LED lighting maker Laster Tech as well as LED epitaxial wafer and chip makers Epistar and Genesis Photonics have stepped into automotive MCPCB LED lighting, according to industry sources. Lite-On Technology, faced with large decreases in LED MPCB lighting prices and weak demand for LED backlighting, has focused 2016 LED operations on outdoor and automotive lighting, the sources said. Lite-On Technology has adopted patent-protected LED chips produced by Philips Lumileds Lighting specifically for making automotive lighting products, the sources indicated. Lite-On Technology has obtained orders for automotive lighting from about 10 makers in the supply chains of US- and Europe-based car makers with shipments scheduled over the next two years, and aims to increase its global market share from nearly 10% at present to 20% in 2017, the sources noted. Laster Tech has tapped the LED automotive lighting market in China for a while, with Great Wall Motors its the largest client, the sources said. In addition, Laster Tech has obtained orders from China-based automotive part makers and makers in the supply chains of China-based automobile makers, the sources indicated. Currently, Laster Tech occupies about 30% of the China market for LED headlights, the sources noted. Epistar, through a stake investment in Malaysia-based LED packaging service provider Dominant Opto Technologies, has supplied LED chips to package automotive LED devices mainly shipped to China-based Great Wall Motors, the sources indicated. Genesis Photonics has entered car maintenance markets in the US, China and Taiwan and additionally become a supplier of automotive LED lighting for makers in supply chains of Japan-based automobile makers, the sources said. However, Germany-based Osram Licht AG will invest EUR1 billion (US$1.086 billion) to set up an LED device factory in Malaysia and this will bring competitive pressure on Taiwan-based LED makers, the sources noted.